Our day started with devotions with IJM staff at their office in Kigali. After devotions we met with the social work staff on a beautiful balcony overlooking the city to hear about their work with victims, the process of getting information to determine if they could take the legal case and the counseling they could offer. IJM offers TF-CBT informed therapy for parents and child victims. You could hear the heartache as the counselors can only offer counseling to those whose cases IJM agrees to investigate and work for prosecution. They do what they can in those cases where abuse has happened but lack necessary evidence for courts. Unfortunately, there are few options for referral. After IJM we proceeded to go to Ndera Psychiatric Hospital. As the ONLY psychiatric inpatient facility in the country of 11 million people, they about 350 beds. Do the math! About half of their patients are those with serious seizure disorders. Those in the crisis units have severe psychotic and disruptive behaviors. We saw one man who was stark naked. When asked about census, we discovered that while they have 60 or so beds for men in crisis, their current census is 78. Meaning, men share cots for sleeping! 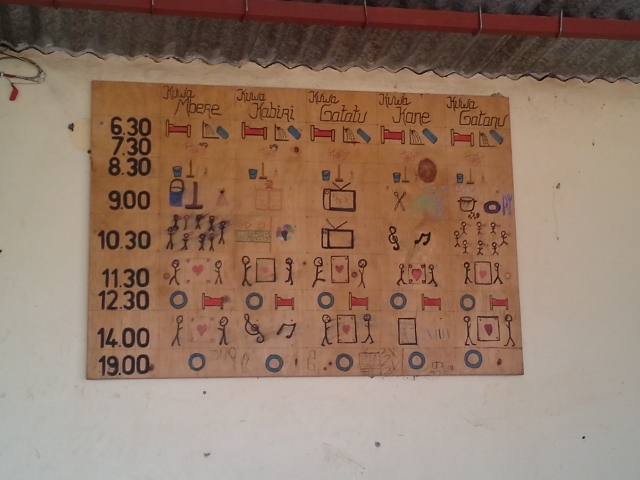 We visited the stabilization units for men and women, the pharmacy, and kids ward [Picture below is of the daily schedule for kids in picture form]. It seemed that the hospital has a few more medications available to use since our last visit in 2009. Then, they only had access to Haldol. Now, they have some atypicals like Risperadone. Most stay at the hospital for about 3 weeks, though we were told that someone was in the crisis unit since 2001! After the hospital, we intended to take a trip to one of the church memorials in Nyamata. However, we were running late so we returned to Solace for lunch and discussions with Bishop Alexis, an Anglican Bishop. Bishop has been engaging with us since 2009 for counseling help. He suggested that we come next time with a plan to engage key principles for a country-wide response so that we avoid overlap. By 3pm, we were on our way to Centre Bethanie on Lake Kivu in Kibuye. Our bus was packed with people and luggage. The road from Kigali to Kibuye has more twists, turns and vistas than you can possibly imagine. Lovely drive, though long. Finally, we arrived 3 hours later (after dark) to the conference center. Dinner was served in the restaurant (open sides to the lake!). Today was a full day in many ways. One fun item: I received an African shirt from other team members. Wore it with pride today. One serious item: on our trip to Kibuye, I sat next to a man who told me his genocide story. Lost wife and 2 children. Survived hiding in the reeds for over a month. He told me how the Lord spoke to him about forgiving his family’s killers and how now he is doing reconciliation work with victims and perpetrators. I am amazed at his strength and struggles.